Terry Calloway had always dreamed of a large family. She’d just thought they’d be children of her own. She never imagined she’d be taking on the daunting task of raising five that were not; five that, for the most part, didn’t want her to become a part of their family. She’d dreamed of love too. Mark Reid, however, was still very much in love with his perfect wife. Could plain and simple Terry ever compete with her memory? Could she ever trust? Would she learn to believe that he could truly love her or would the lies of a scheming ex-husband be her undoing? An unfortunate accident, the death of a spouse, a man in need of help, and the threat of a lost inheritance…can Terry Calloway ever fulfill her dreams in A Marriage of Necessity? 35 year old Terry Calloway looked out the window for probably the 18th time that morning. She wasn’t quite sure what she was looking for. Her visitors weren’t due to arrive for at least another 30 minutes, if they arrived at all. This time she paused as she pulled back the curtains; the vibrant serenity of the day catching her attention. Vibrant serenity? Was that an oxymoron? Could those words walk side-by-side? They had in her life once upon a time. She thought back to a day when all seemed as bright as the day that swirled outside her window. She’d felt so peaceful then, as if the world belonged to her. 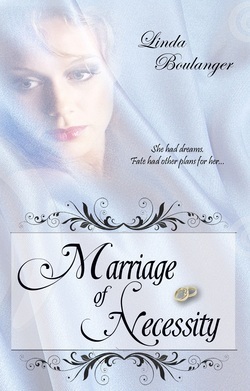 She thought of her dreams, her desires, including a husband that loved her and a large family. No, she thought. I’m not going to think about that today. Yet how could she keep it from her mind? It was the very thing that had led her to this crazy meeting. Wrong choices. Please God, she thought, please don’t let me make another one, and especially for the wrong reason. On the other side of town, 44 year old Mark Reid was struggling to retain his composure as his younger brother filled him in on an absurd plan he’d hatched. Mark fought distractions as he listened. His mind ordered all the things he needed to get done before his mother returned with his 5 children. He didn’t have time for lunacy, not when he was battling the challenges of keeping his family ship afloat. “You know, Brad, if I had the money for a live-in nanny, don’t you think I’d have hired one by now? Sara’s been gone for almost a year. Look around, brother! It’s obvious I can’t keep up with all this. I do need help and desperately. But, hello! Taking care of 5 kids doesn’t exactly come cheap!” Mark ran a hand through his disheveled, dark hair that showed only the slightest signs of aging with a few wispy grays at the temples. Now it was Mark’s turn to stare. “Brad! You’re an absolute idiot. Now why on earth would I marry some woman I’ve never even met?” Mark’s jaw worked in a familiar manner that told Brad his older brother was beyond irritation. If they’d been kids still, Mark would have already jumped on him and allowed his frustrations to flow out through his fists. Brad was glad he was now the bigger of the two brothers. Mark took a deep breath as reality slapped him in the face. He felt that familiar fist in his gut, the one he’d felt near-continuously ever since they’d found out Sara was sick. He put his hand over his eyes, squeezing his temples to stop the throbbing as he thought. Sara, Sara…why? She’d been their anchor, their captain, their figurehead spiriting them along. Their whole lives had been built around her, by her. She’d taken care of everything…and now she was gone. Mark was left to try to carry the family on his own; a job he was ill-equipped to handle. He did need help. He needed it desperately and he needed it now. He looked at his brother. Hopeful blue-gray eyes looked back. So that was the answer. It wasn’t that there was necessarily anything wrong with her that would cause her to potentially agree to take on someone else’s brood of five, although that in itself might qualify her for the asylum. He needed help. She didn’t want to lose her inheritance. Was that enough for a marriage? “Just come and meet her Mark. Please? For your kids and for her…” Brad pleaded. The two brothers stared at one another for a couple of silent minutes. Mark looked around at all he needed to do knowing he couldn’t possibly get it done anyway. “All right, but this is insane, brother. Insane!” Mark blurted out at last causing Brad to leap to his feet and pull his brother into a rough hug. Thus Mark found himself in the passenger seat of his brother’s car going to a place where it would be determined if a modern-day marriage of necessity could be arranged. As they drove to her little apartment for Mark to meet her for the first time, he questioned his brother as to what might be wrong with Terry Calloway that she couldn’t find anyone else to marry her, especially if there was money involved. Better yet, why would she want to marry a guy with five children? They overwhelmed him. Think of what they would do to someone who was unaccustomed to kids. “Look Mark. The department she’s in is closing. There are no openings for her within the company and you know what the job market’s like these days. I think that in itself would be scary enough. Then the thought of losing something that should be rightfully hers on top of that… Her dad put the clause in as a joke never believing it would be an issue, but since it is, the trust company is being a stickler. Somebody wants what’s not theirs.” Brad also told Mark how he felt somewhat responsible since he’d urged Terry to come to work for Time Safety many years before. He also put in that she was a great gal with a gentle soul and skirted around the fact that life had handed her a bit of a raw deal which had made her gun shy of men. “Brad! Hi!” The not-half-bad-looking woman greeted his brother a bit too enthusiastically, belying her nervousness. Her light blue eyes tentatively appraised Mark. They were kindly eyes with perhaps a hint of fear and skepticism. Mark suddenly felt as if he were on an audition. He knew the doubts that swirled in his mind. Surely they were also firmly implanted in hers, if she had any sense. From what he could tell in that first impression, he was sure that she did, which made him even more surprised that she would even agree to the meeting. Standing in her doorway, he found his interest in the potential of the situation piqued even though this was all so crazy. “Terry, this is my brother Mark. Mark, Terry Calloway,” Brad introduced them then looked from one to the other when neither moved. “Uh…the one’s I’ve been telling you each about?” The two just stared at Brad, briefly glancing at each other. “Hello!” Brad said impatiently. “Right, right, uh, hi!” Mark blurted out as she raised her hand to him and they awkwardly shook. “Uhm…won’t you come in.” Terry motioned for them to move further into the small living area. It was clean and cozy, Mark thought. She’d made the best possible use of every available space and she seemed extremely organized. He was impressed. Though how difficult could it be for a woman alone? Wait until his three girls and twin boys were thrown in. Not to mention the cat. Cats, he corrected as a fluffy whitish feline pranced into the room and jumped up right where he’d been about to sit. “Shaw!” Terry scolded as she walked toward the cat. “Oh, I’m sorry. She’s used to being the queen. You’re okay with cats? I mean, Brad said you liked cats.” She seemed suddenly apprehensive as she had to brush by him to scoop up the cat. “Oh, no. I love cats. We have a cat. He thinks he rules too.” They laughed awkwardly. Mark did note that her laugh was light, sweet. He added without thought, “He was my wife’s baby…” His words trailed off and silence ensued. Mark snorted, surprised at his brother’s abruptness. Terry looked away, reaching down to pet the cat for distraction. It gave Mark the opportunity to look her over again. He was sure a slight blush stained her cheeks. He found that somehow endearing. How awkward this must be for her. For them both! She was a nice looking woman. Not ravishing like Sara, but not bad. It appeared she took care of herself, yet he wouldn’t think she was a freak about it. Her dress was casual, which he liked. Her hair, a sandy blonde mass of shoulder length curls that she continuously tucked behind her ears, complimented her coloring perfectly. He’d like to see it longer…he’d always loved Sara’s straight, long, blonde hair. Terry glanced back at him, her timing perfect to pull him back from his musings. He liked what he saw in her eyes. Without knowing her he got the feeling a kind soul lived behind them. He also sensed something else. Terry had a need to be needed. He smiled at her. “Are you willing? Truly?” he asked tentatively. Fearful relief washed over Terry’s face as she nodded. Another oxymoron, she thought. Her life seemed riddled with them. Brad jumping up with a loud whoop gave her no time to ponder the thought. He grabbed her, hugging her, and spinning around. “I knew it. I knew it, knew it, knew it. I knew it was perfect.” He released Terry and noogied his brother who pushed him away and tried to straighten his hair. “You’ll see. Both of you,” Brad said looking triumphantly from one to the other. “This is going to work. I feel it.” Terry and Mark both looked hopeful. Brad jabbered on and on as he drove Mark back to his house. Mark was quiet though his brother seemingly didn’t notice. He couldn’t believe what he’d just done. He wondered what his children would think. What would Sara have thought? “If something ever happens to me, you just make sure you find someone that’ll take good care of my kids,” she’d told him once. “What about me?” he’d pouted. “How right you are. Only one perfect woman in the world and she’s all mine.” He’d nuzzled her neck which had led…well, it had led to their twin boys; two more children for this someone else to take care of. Mark hoped Brad was right about being right for both of them. Twenty minutes later, staring into the stony faces of his children, he had his doubts. He tried to explain the absolute divine reasoning behind his decision but, being uncertain himself, it was an impossible task. Once again, he was saved by his mother. The best, Mark thought as he watched his children march away offering him nothing but chilling glares. One by one they filed off to their rooms, each with his or her own thoughts on the matter. Was he truly doing what was best? Had he let his need for help and a pretty face make the decision for him? He thought of his mother’s words. There was so much to all this that he obviously didn’t know. Still, he centered on one phrase in particular. She needs you kids. Why, he wondered. Regardless, they’d all be meeting the next day. Brad and his mom would return along with a batch of his mom’s famous homemade chicken and noodles. It would all be okay. It had to be okay. Mark breathed deeply a few times then went to his room, the room he’d shared with Sara for eight years before her death. God how he loved her. He sat down on the edge of the bed completely overwhelmed. “Daddy? You okay?” Madi’s sweet voice floated in from the doorway. Mark pulled his hands away from his face and smiled as best he could at the hesitant figure of his nine year old daughter. His heart pitched. Of all his children she looked the most like his beautiful Sara. “Come here, love.” He held out a hand and she moved quickly across the floor to be wrapped in the comfort of her daddy’s arms. “Will she be nice, Daddy? The woman? What was her name? Terry?” She was filled with questions. “Yes, baby. She seemed very nice,” he tried to soothe her fears. “Then everything will be okay.” She patted his arm. She shrugged her shoulders then wiggled off his lap seemingly satisfied with the upcoming change. At the door she turned back. “Mommy told me she’d send us someone nice. Terry must be the one Mommy’s sending.” She turned and skipped from the room. Mark stared after her. He wondered when Sara had told that to Madi. Madi had spent so many hours sitting still beside her dying mother. They’d talk. Madi would read to her, comfort her as only a child can. It was as if she was soaking her in before there would be no more. He looked around the room. He wasn’t prepared to share it with anyone else, married or not. He wondered what Terry’s expectations were. It was purely a marriage of necessity. It was that for her as well, right? He thought of how she had flinched slightly when they’d touched. He hadn’t noticed that when his brother had touched her. Why wasn’t he marrying her to help her get her inheritance? He was a bachelor after all and Mark would guesstimate they were close to the same age. Why then… Madi’s words floated back to him. Terry must be the one Mommy’s sending. “Oh Sara. If only this truly could be by your hand,” he whispered.